Opening hours: Shops: Monday-Friday 09.00 - 13.00 and 15.00 - 19.00. Saturday 09.00 - 13.00. Many of the larger stores in the main tourist areas may stay open through lunch, and until 22.00. Most shops are closed on Sundays. Shopping centres: Daily (including Sundays) 10.00 - 22.00. Banks: Monday-Friday 08.30 - 15.00 some open on Saturdays 09.00 - 12.30. Open Monday - Friday 09.00 - 20.00, Saturday and Sunday 09.00 - 18.00. Madeira Archipelago has a lot of activities and experiences to try during a visit to the islands. Most of these activities can be planned in hotels or through specialized agencies that will help you to make the most of your journey. This can go from outdoor activities, to relaxation and wellness experiences. You can enjoy a lot of unique moments, because in Madeira you are in a constant contact with nature. For Nature lovers, Madeira is the ideal destination for planning your active vacations. Also, there are different other things you can do, while in Madeira, such as visit cultural centres spread throughout the Island, appreciate the festive events that are part of our calendar, or simply enjoy our simple and nice city life. 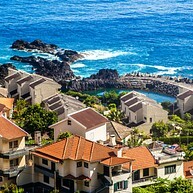 Here you can find more specific information about thing to do in Madeira Islands. 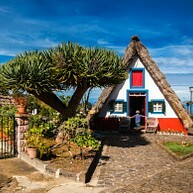 Santana is mostly known for its typical straw houses and for the Theme Park (a fun place for all ages) which spans the history, tradition and culture of Madeira. Santana offers one of the most beautiful strolls on foot, with 6 parishes that invite you to discovery (Arco de São Jorge, São Jorge, Santana, Faial, São Roque do Faial and Ilha). Funchal, the capital of Madeira, is located on a bay and started out by occupying a small extension of land by the sea, going up on the mountain slopes as it grew. A few walking minutes away, it is possible to stroll down the centre of the city, where you have access to all commerce and services, and can also visit the town’s main ex-libris. It can be divided into 3 historical parts, which are also its first three parishes: São Pedro, Santa Maria Maior and Sé. 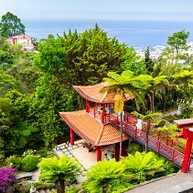 Monte is the highest parish over Funchal, known for its history and floral abundance. After visiting, those with a healthy heart and adrenaline lovers can slide down in the traditional wicker sledges - "Carros de Cesto" - a means of transportation that was very usual in the old days. Halfway between Funchal and the Council of Santa Cruz, in Caniço de Baixo, you can find the first exclusively nautical reserve made in Portugal known as Garajau’s Natural Reserve. Just a mere 9 km away from Funchal is Câmara de Lobos, a town which was, until not too long ago, a fishermen’s town, known as such since the discovery of the island, thanks to the sea-wolves inhabiting the bay. Câmara de Lobos also became known thanks to Winston Churchill’s paintings. Located 18 km from Funchal, Ponta do Sol has one of the best preserved historical centres on Madeira. This historical centre grew with the development of the sugar industry. It is obligatory to visit the magnificent Cais da Ponta do Sol, and the Ponte do Caminho Real, in the west side. At the North of the Island, crossing the central ridge, stands São Vicente. The town has a Volcanology Centre at the São Vicente caves, where you can visit the impressive underground lava corridors and explore other geological wonders. If you follow the road west, you'll eventually reach Seixal, which offers one of the most beautiful landscapes of the north coast of the Island. It has some natural sea water pools, formed by rocks, where the visitor may take an invigorating dive. Seixal’s sea water reflects the green hues of the powerful slope standing above and covered with vegetation, interposed by waterfalls. Seixal also has one of the few black sand beaches on the Island. In July 1419, João Gonçalves Zarco and Tristão Vaz Teixeira, who discovered the Islands, came ashore in the beach of Machico. This same beach is now covered with golden sand. To get to know the history of the municipality, the best thing to do is to visit the Museum Nucleus in Solar do Ribeirinho. A drive to Pico do Areeiro, the third highest part of the Island, offers visitors a magnificent landscape of the central ridge and its peaks. The footpath connecting Pico do Areeiro to Pico Ruivo is one of the most beautiful, but also one of the most challenging ones. For those who cannot cross it and still wish to enjoy the magnificent landscape from the highest spot of the island, an alternative and much more accessible footpath allows reaching the peak through the other side, starting with the route in Achada do Teixeira in Santana. 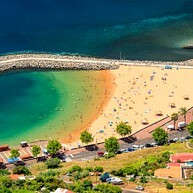 Porto Santo, located some 40 Km northeast of the Island of Madeira, has a low population. It is very quiet during most part of the year, and is an idyllic place for those seeking to run away from stress and rest. The 9 km extension of its golden sandy beach, bathed by warm and serene waters, is particularly appreciated by those who enjoy going to the beach, which is possible to do all year long. 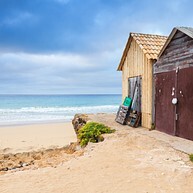 The island of Porto Santo has a wide variety of outdoor activities to offer the tourist such as diving, big game fishing, sailing, canoeing, wind-surfing and kite-surfing. Much less hilly than Madeira, the island of Porto Santo is also perfect for bicycle strolls. Bikes can be rented at hotels or downtown. Climb up to the clouds among mountains and levadas and enjoy the pure, rarefied air or discover treasures as you explore the depths of the Atlantic. You can choose between trekking, climbing, canyoning, jeep safaris, mountain bikes or horse riding to conquer the impressive mountains. 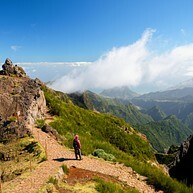 Don’t miss the chance to go hiking, the number one favourite for Madeira’s visitors. Hang-gliding and paragliding are also very attractive sports as the island’s natural terrain is ideal for it. Talking about nautical sports, there are countless choices: it is possible to try diving with dusky groupers, dolphins or seals, or go surfing, windsurfing, jet skiing or water skiing for an unforgettable experience. About 20 million years ago, Laurissilva Forest covered large areas of the south of Europe and of the Mediterranean Basin. This prehistoric relic survived the ice ages; the distinct flora is completely extinct it in all other sites except in Macaronesia (which includes the Azores, Madeira, Canary Islands and Cape Verde). Madeira contains the largest area of Laurissilva Forest of the world. In fact, it occupies around 15,000 hectares, located mainly on the north slopes of the island. Due to its biological specificity, the diversity of its endemic species and its well-preserved condition, in 1999 Laurissilva Forest was granted by UNESCO the World Natural Heritage classification. This forest consists of large trees, mostly belonging to the "Lauraceae" family, namely the laurel, the mahogany, the til and barbusano, alongside others like picconia excelsa, the heberdenia excelsa, the Lily-of-the-Valley tree, the buckthorn and ilex perado. Beneath the canopy of these trees evergreen bushes also abound, such as Madeira blueberry, the shrub trefoil and the heather, and closest to the ground there are ferns, mosses, liverworts, lichens, and other smaller plants. Within the forest, which is especially rich in terrestrial molluscs and insects, several rare bird species can still be seen, including the Madeira Laurel Pigeon and Firecrest, which are the only endemic species of this ecosystem. Madeira’s matchless soil and climate, the production process and the grape varieties are what makes Madeira wine so unique. Chosen to celebrate the independence of the United States on 4 July 1776, praised by Shakespeare in his plays and admired by monarchs, princes, generals and explorers, Madeira wine is certainly a treasure. It is appreciated all over the world and has more than five centuries of history. This ‘nectar of the gods’ is one of Madeira’s finest achievements. 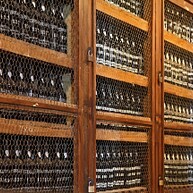 There are more than 30 Madeira wine grape varieties, though the best are Sercial, Boal, Verdelho and Malvasia. The most well-known dry wine is made from Sercial grapes. This pale, strongly perfumed wine makes for an ideal aperitif. Verdelho leads the medium dry wines. It is golden, delicate and quite fragrant, and is the best one for drinking with meals. Boal is medium sweet, smooth, velvety, noble and dark gold in colour and goes well with roast meat or dessert. Between meals or with dessert, few can resist a Malvasia, a sweet, red, full-bodied, intensely fragrant wine. Connoisseurs of the art should come to Madeira in September to see and participate in the Madeira grape harvest and its festival, a tribute to this age-old product that is recognised worldwide. Prepare to discover a fantastic natural world on one of the unforgettable walks along the hillsides. 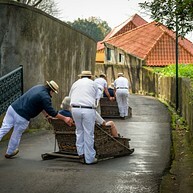 Cultural and environmental factors have made walking one of Madeira’s most traditional and popular open-air activities. Lots of people come to the Madeira Islands just to walk the different circuits, discovering the pleasure of close contact with nature. 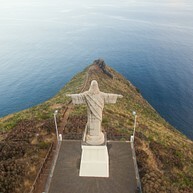 Walk along Madeira’s paths and levadas to the interior of the island and see breathtaking virgin scenery. On these magnificent walks, hikers of all ages can explore the island’s unforgettable landscapes. Madeira’s natural heritage has been singled out in Europe, thanks to its amazing richness, diversity and state of preservation, which is due in part to the Madeirans’ respect for their natural heritage. On 2 December 1999, UNESCO recognised this and considered the Laurissilva Forest a World Natural Heritage Site, the only one in Portugal, which now belongs to all humanity. You must find time to admire and enjoy this forest which dates back to the Tertiary Age and survived the last glaciations, which confined it to Macaronesia, i.e. 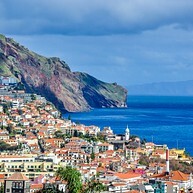 Madeira, the Azores, the Canaries and Cape Verde. 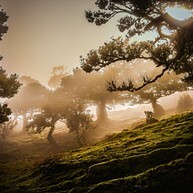 Madeira has the largest area of this type of forest, about 22,000 hectares. It also has the widest variety of fauna and flora with some rare specimens, such as the Madeira orchid, Dactylorhiza foliosa, which is unique.